Philadelphia, PA – Today, Governor Wolf was joined by Acting Secretary for the Department of Drug and Alcohol Programs Jen Smith, Mayor Jim Kenney, Philadelphia Police Commissioner Richard Ross, Drug Enforcement Administration Special Agent Gary Tuggle, and executives and staff of Walgreens to celebrate the success of the prescription drug take-back box program and to formally announce additional funding to provide the Philadelphia police with naloxone. “The opioid and heroin abuse crisis has hit Pennsylvania hard and this crisis doesn’t discriminate – it hits every age group, every creed, color, and income level,” Governor Wolf said. “We know that one of the leading causes of opioid availability, which can lead to a crippling and life altering addiction, is over prescription of these powerful drugs. In collaboration with partners such as Walgreens and local law enforcement, Pennsylvania has created over 580 drug take-back locations in its 67 counties. Addressing prescription drug misuse, abuse, and overdose is a major component of Governor Wolf’s commitment to fighting the opioid abuse epidemic in Pennsylvania. The Department of Drug and Alcohol Programs, in partnership with the Pennsylvania Commission on Crime and Delinquency and the Pennsylvania District Attorneys Association, has worked to install secure and permanent prescription drug take-back boxes in communities across the state. Walgreens has participated in the drug take-back box program in Pennsylvania since late December. Since 2014, Pennsylvania communities and their partners have properly disposed of and destroyed over 118 tons of prescription drugs. In 2016 across Pennsylvania, 124,335 pounds, or almost 62 tons of unwanted prescription drugs were collected and destroyed by the Pennsylvania Attorney General’s Bureau of Narcotics Investigation, the Pennsylvania National Guard, and the DEA. Last October, during its fall National Drug Take-Back Day, the DEA and its partners collected more than 893,498 pounds (about 447 tons) of unwanted prescription drugs at almost 5,400 collection sites. To find a take-back box location for the disposal of prescription drugs, visit https://apps.ddap.pa.gov/gethelpnow/PillDrop.aspx. 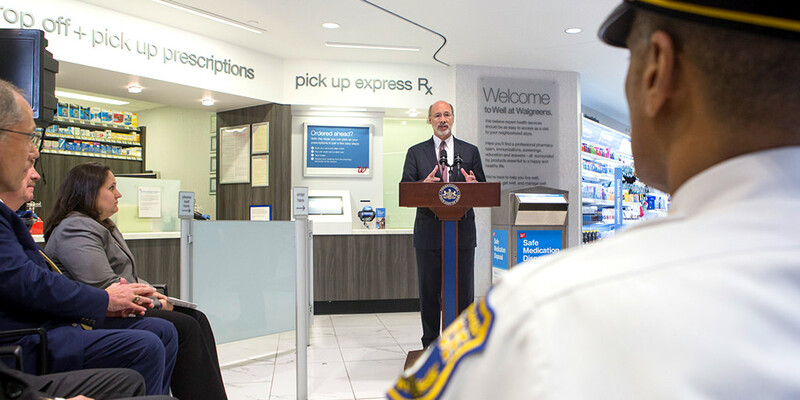 While at Walgreens, Governor Wolf also formally announced the award of $200,000 in funding from the Department of Drug and Alcohol Programs (DDAP) for approximately 5,000 naloxone kits to be purchased by the Philadelphia and SEPTA police. The number of opioid overdose deaths in 2016 is expected to be higher than 2015 when 3,500 people died from overdoses. If you or someone you know is suffering from the disease of addiction, call 1-800-662-HELP or visit www.pa.gov/opioids for treatment options.